I finally found some time to finish and publish the first release of a tiny library that allow to easily integrate Google Maps in every J2ME application: MidMaps. You can read all the details, download the library together with sample code, and read the full JavaDocs here: MidMaps – J2ME Google Maps library. i am using your library.yours is a nice application but the only problem is that it shows path as a straight line instead of road to road view.please help me out with a solution that how should i show such road to road path in my application.Thanking you. Hi I like your API it works perfectly on the SUN emulator but does not work on the Nokia emulator nor Nokia device am getting the following error. can we add important location like hotels,historical monuments, etc to static maps. How to i solve this problem.. Help me.. 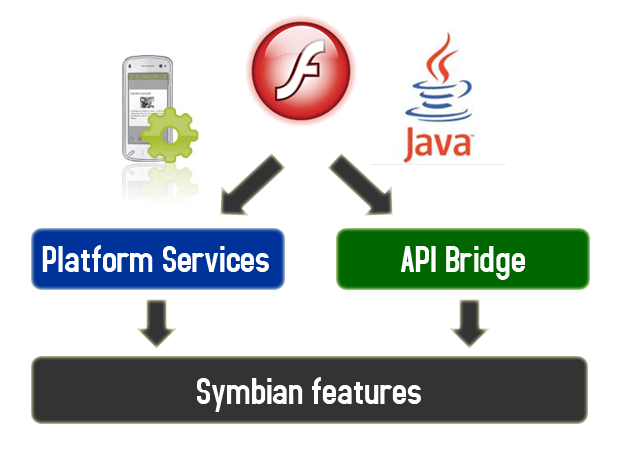 When developing a Flash Lite, Web Runtime or Java ME application based on API Bridge, one of the things you know you’ll have to deal with is the Symbian packaging and signing process. For single-person and small developer teams, the whole Symbian process could be a not suitable option. For this reason, I’ve looked for an alternative deployment approach that could bypass this process. The approach presented here is based on a delayed deploy model, meaning that the API Bridge engine is not deployed with your application, but in a successive moment: actually, it is deployed only when the application needs it. If the target devices support Platform Services, the AppManager API can be used to retrieve the list of installed applications, and so to check if API Bridge is installed on the device itself. apiBridgeFound: if true, it means that the API Bridge engine is installed on the device. If false, the API Bridge engine is not installed. apiBridgeCheckError: if not null, it means that there was an error while checking for API Bridge, due to the AppManager API. In this case, the application cannot actually know if the API Bridge engine is installed or not. Since the API Bridge engine works as a local HTTP server running on the mobile phone, the other possible approach is to make an HTTP request, and to check if any response from API Bridge comes. Note: this approach works by using the API Bridge default port (9080). There are no guarantees that this port number is fixed, and that it will not be changed in future API Bridge releases. For this reason, my advice would be to use this second approach only when Platform Services are not available. The code below shows how to make a request to the local API Bridge HTTP server, and how to check if it’s running or not: if it is running, the response status of the XMLHttpRequest object has to be different than zero. The approach described here can be used also when using API Bridge from other languages, as Flash Lite or Java ME. Anyway, when working with Flash Lite, in the scenario where API Bridge is not yet installed, you will incur in the typical (and horrible) error popups, that will inform you (and so the user) that the network call failed. On the other side, these approaches have the main drawback on the user-experience side, since your users could be asked to download and install an additional component when they start to use your application. Anyway, this event will happen only once at most, so it could be considered reasonable in most scenarios. Hi Alessandro , I’m trying to understand how to package/install a custom API bridge with a J2ME app. A specific post about that would be great. Thanks. Hi Alessandro, Is there anyway to change themes phone using APIBridge by requisition for wrt ? I wait answer, Thanks ! I’m trying to use APIBridge on my app as you explain on this post, but whenever I try to do a function call (ie: retrieve the list of photos, or resize an image), the app crashes without any warning. Just quits and that’s it. The APIBridge detection is working as you outlined. Do you know any way I can troubleshoot, where/if any logs exist that explain the cause? API Bridge version 1.1: plug-in creation package released! The announced new version of API Bridge is out! With the new 1.1 release it is finally possible to create custom plugins that access all the Symbian functionalities, so practically opening up the doors to a new generation of Flash Lite, Web Runtime and Java ME applications. 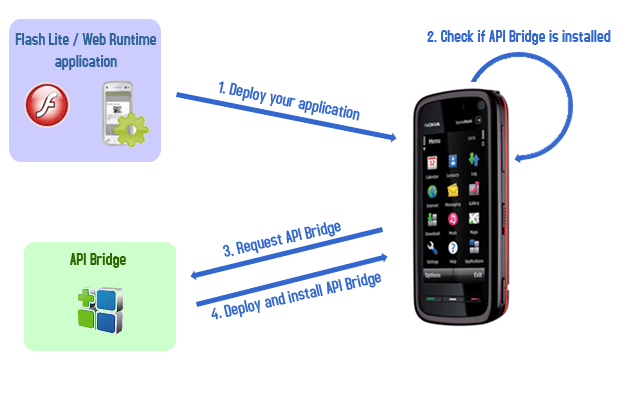 Start downloading the new release from Forum Nokia: API Bridge release 1.1. For more information about API Bridge, check out its Forum Nokia page. Hey Anybody knows how to crate new plugin dll with APIBridge. My DLL is not getting invoked when i call from echoTest widget sample. If you’re developing applications for Nokia devices, and more specifically Web Runtime, Flash Lite or Java ME applications, you probably already had to deal with the platform limitations, and with the tools and libraries that allow to go beyond these limitations by adding more capabilities. Both of them provide a set of tools and libraries that, added to your applications, allow them to access more functionalities than the ones that each technology naively supports. So, which approach is the best one? It’s not easy to give a unique answer to this question, so let’s go into details. The Platform Services library is available from more time, and there’s a well established set of resources and code examples that will help you to quickly get your functionalities ready and running.The primary source of information is Forum Nokia Library, that has a detailed references of APIs and useful sample code. Then, also Forum Nokia Wiki provides an extensive set of examples that cover all the possible usage scenarios. Even if there is some little parts where this information could be improved, you shouldn’t get much in trouble when using Platform Services in your application. API Bridge is a fresher technology, released on November 2009, and so it’s harder to find complete documentation and usage examples. Anyway, Forum Nokia released a set of libraries for various platforms (Flash Lite, Web Runtime and Java ME) that will definitely help in starting to use API Bridge. Platform Services are fully supported starting from S60 5th edition devices, but are also compatible with a subset of S60 3rd edition Feature Pack 2 devices: the full list of supported devices is available here: Web Runtime 1.1 compatible devices. This means that you can use them only on the touch screen Nokia devices. It is currently available also a beta release of Platform Services 2.0, that adds to this features’ set also the access to the device camera. Platform Services are currently available for Flash Lite and Web Runtime applications. API Bridge libraries have been released for Flash Lite, Web Runtime and Java ME. Generally speaking, the API Bridge engine, working as a local HTTP server running on the device, is accessible from all technologies. The current implementation of Platform Services and API Bridge don’t allow to decide which approach is the best one, and there is no need to do it anyway. Right now, if you’re working in Flash Lite or Web Runtime, and as long as your set of target devices support them, you can benefit of both technologies, including the two libraries in your application. Talking about future perspectives of both approaches, we can see both of them evolving in more mature products. Platform Services 2.0 is already available as a beta release, so you can already start experimenting with the new APIs and features, including the access to the device camera. On the other side, API Bridge promises to allow everyone to create custom plugins, through the ECOM interface, as reported on Forum Nokia Blogs. Concluding, Platform Services, with the already mature and features-rich library, surely represents a simpler approach for developers who don’t want to deal with Symbian building and packaging, while API Bridge, with its plugin architecture becoming mature and open to developers, could definitely end up to be the best ally to allow widgets and Flash Lite apps access more and more features. >On the other side, API Bridge promises to allow everyone to create custom plugins, through the ECOM interface, as reported on Forum Nokia Blogs. I hava a problem using APIBridge.fileUpload method to upload a photo to the server. The method failed with error:404. The problem is driving me mad ! Do you have any suggestions? A new Java ME application is available, currently only in Italian language, for all BMW fans! X1 Mobil allows to discover all the secrets of the new BMW X1, together with launch events, sport news, travel information and much more, with just a few clicks. The current version is compatible with various BlackBerry and Java ME enabled devices. Check out the app download page for more details: BMW X1 Mobil download page. After a while far from Gcal development (due to a lot of undercover work ) here is a new update for the Java ME Google Calendar client, specifically released to fix the different timezone issues that various users are reporting. JAD file is also available for download here: Gcal JAD download. One other request–is there a way to make it able to see a month view at a time? Or can it do that now and I just don’t know how? Thank you for the time-zone functionality. ¿¿¿One of the questions is whether the program works offline or if there is to be connected? Phone: Samsung SCH-R610. Version 0.3.3 used to work. Then it stopped working. When I try to enter my password the text window on the phone allows me to input my full password, but when I accept the password and the screen returns back to the gcal login screen it only shows the first 5 character of the password. Obviously google won’t allow me to log in without the full password. Upgraded to 0.3.5, but same problem. I use Willcom WX341K (PHS). But I can not login google account. I can push “Cancel” / “Ok” button…. I’m not able to download the jad part using the provided link. @morguena: thanks for your feedback, I’ll check your issue and let you know what I find. GCal works online. Browing events offline would be a nice functionality, but it is not currently implemented. @Louis de Lange: unfortunately this is a known issue, but I currently have not a fix for it. I’m actually working on it, and hope to have good news asap The five ‘*’ are only for security purposes, to avoid displaying the exact length of the typed password. @s t: unfortunately I have not that device to make tests, but I’ll check if I can find a fix for it. @Nuno Gomes: which error do you get when downloading the JAD? Edit functionality is surely planned, hope to include it in a very next release! is there a way to display Google´s tasks? They don´t show up on my calenders. Hi, I can’t create a new event in my Google Calendar. When I click Create, program write “Error while saving new event (java.lang.Exeption:CODE:403)”. What setting I can changed in Google that it work??? I’ve just installed this version on my Nokia N97 (previously had an E90), and all day events are showing up in the following day’s events list, saying “To All Day” (which is a strange phrase in itself). I’m pretty sure this didn’t used to happen on the previous version of GCal which was installed on my old phone. Then I realised that Use server timezone was set to No with Timezone +01:00 by default (I think the default should be to use it, as it was in previous versions where you had no choice). Setting Use server timezone to Yes fixed the problem. Presumably with a manual offset of +1, gCal thought All Day finishes at 1:00am? Love the GCal app but 0.3.5 doesn’t handle Eastern Time Zone “All-Day” events correctly. I have an all day event for 10/30 and it shows on 10/29′s list of events. Doesn’t matter what settings I use it will not work correctly. I have it set to be -04:00 and the times show correctly on regular events but the AllDay event is wrong. My Google calendar is set for Eastern GMT-05:00 but if I change Gcal to that my times are off an hour. Hi Pit, thanks for this GREAT app. One question: when I add a new event to my calendar from the app, it does not create a reminder for the it on Google, even though this is set as default on the website. Any way to fix this, please. @Grigory: are you creating an event on your personal calendar, or on a shared one? Is there a way to create repeating events in Gcal? This is still a great application that I use quite often. If Use server timezone = Yes, the correct timezone is used for the primary calendar, but additional calendars do not seem to use the server timezone, so events show at the incorrect time or as All Day. If you set Use server timezone = No, and set the timezone manually, then all calendars show the correct time. Please continue developing this app! Hi, there is anyway to setup reminders when creating an event? It would be really nice.